Beautiful resorts establish the state of Quintana Roo as one of the top destinations for offering beauty, choice, comfort, relaxation, fun, and adventure to those choosing to have a Mexican wedding. This area has so many choices of resorts specializing in Caribbean weddings and honeymoon packages in Cancun that you will want to speak to one of our Caribbean wedding specialists. 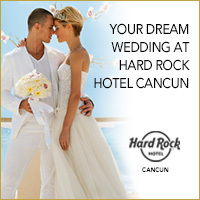 For Cancun's best Caribbean wedding resorts and wedding packages click here.